Upon arrival at the Kolkata airport, our tour representative will greet you and assist you in smooth transfer to the hotel. Stay overnight in the hotel. In the morning, assemble at Millennium Park to board the jetty. By afternoon, the cruiser will start sailing down the Howrah Bridge, Belur Math and Serampore. Here guests have a choice to visit either Serampore or Barrackpore, each of which bears colonial significance. Later, guests will be ushered to Chandannagar colony, which was under French rule from 1673 to 1952. It did come under the possession of English twice but was restored to the French. The erstwhile mansion of French administrator now houses a library, a French school and a museum of antiques, art and sculpture. The day 3 starts with a visit to Bandel-the erstwhile Portuguese colony. You will visit to Bandel Church, the oldest Christian Church in West Bengal. The Church was built around 1660 by the Portuguese and is dedicated to Nossa Senhora di Rozario. Later, board the cruise and sail up to Kalna. 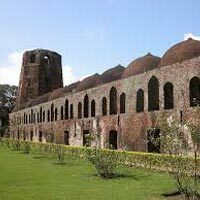 The main attractions of Kalna are terracotta temples and Rajbari. After a short cruise ride, visit Weavers colony at Phulia/ Shantipur, famous Tant, the famous Bengal cotton. Here you can buy fine cotton stoles, saris and dhoti from the Cooperative stores. Later, sail towards Mayapur. Today, guests will be taken to Mayapur- the headquarters of ISKCON. Later cruise towards Katwa while meandering through the country side. Later, guests will meet Kansari artisans whose brass and bell metal utensils are quite famous. It is the main occupation of Barman family who have inherited the art of making Brass utensils by primitive casting methods. Thereafter, cruise towards Murshidabad passing through countryside. The day 5 is scheduled for a full day tour of Murshidabad. One of the oldest cities in West Bengal, Murshidabad stands as a testimony to the rich heritage of Nawabs of Bengal. Later, visit to Katra mosque and Katgola Gardens. Katgola is the erstwhile palace garden of Raja Dhanpar Singh Dugar and Lakshmipat Singh Dugar. Besides, you will visit the famous Adinath Temple, built in 1873, by Harreck Chand. 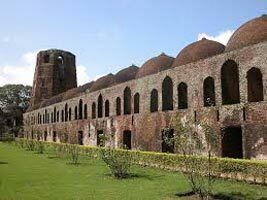 Besides, there is Khushbach Cemetery, which houses the remains of Ali Vardi Khan and Siraj Ud Daulah. Later, depart for Murshidabad followed by cruise trip to Katwa in the evening. Today, after breakfast in the morning, check out of the cruiser at Murshidabad and drive to Kolkata. Upon arrival in Kolkata, you will be transferred to the Kolkata airport to board flight towards next destination.